Once all the registered oil refinery projects become operational, the refined oil supply would be double the domestic demand. One more foreign investor has expressed the willingness to develop a petrochemical project in Vietnam, extending the list of the expected oil refinery projects in the country. 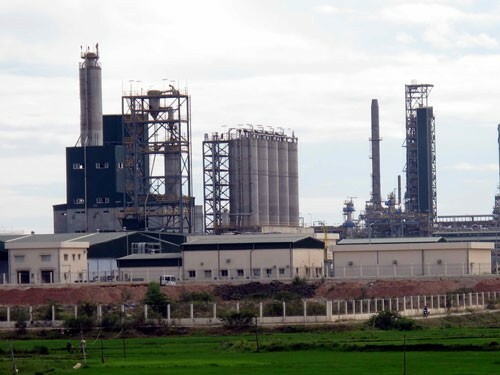 Thai PTT Group has had a working session with the Binh Dinh People’s Committee on the Nhon Hoi petrochemical plant in the Nhon Hoi Economic Zone. The oil refinery, expected to be the biggest one in the world, has the design capacity of 660,000 barrels per day, or 30 million tons per annum, and the huge investment capital of 28.7 billion dollars. In order to implement the project, PTT would have to seek capital from the Vietnamese partners and other sources. Tran Ngoc Nam, Deputy General Director of Petrolimex, the biggest importer and distributor of petroleum products in Vietnam, said he has not heard anything about the cooperation between PTT and Petrolimex in the project. The national oil and gas group PetroVietnam, besides the operational 6.5 million ton per annum Dung Quat oil refinery which now provides 30 percent of the total demand, is also planning to implement the Nghi Son and Long Son petrochemical projects. If Nghi Son, which has the designed capacity of 10 million tons per annum for the first phase, becomes operational, both Nghi Son and Dung Quat would satisfy 50 percent of the total domestic demand a year. Oil and gas groups all seem to have the ambitious plan of developing petrochemical projects. However, the required huge capital has always been the biggest obstacle which slows the project implementation. The Can Tho Oil Refinery project initiated by the Vien Dong Trade and Investment Company and the US Semtech Ltd BVI, for example, got the license in April 2008 already. However, the project has not been kicked off yet. Prior to that, the investment capital was lowered from 500 million dollars to 350 million dollars, while a partner has quit the project. Meanwhile, the Vung Ro oil refinery in Phu Yen province has just restarted after a long period of interruption due to big difficulties. If all the registered petrochemical projects become operational, the total designed capacity would reach 60 million tons per annum, including petrol, diesel and LPG. At present, the average petrol consumption is 15 million tons per annum, while the figure is expected to increase to 15-20 million tons per annum in 2011-2015. The total consumption demand is expected to be 27 million tons per annum by 2025, which would be double the domestic demand. Meanwhile, Tran Viet Ngai, Chair of the Vietnam Energy Association, has warned about the lack of crude oil to feed the oil refineries. The average crude oil output is about 14-15 million tons per annum. If Vietnam starts to exploiting the oil wells offshore, the crude oil output would be higher. However, Dung Quat alone would need a very high volume of crude oil, which means that Vietnam would have no more crude oil for other oil refineries and export. Therefore, the investors of oil refinery projects all think of importing crude oil from the Middle East, South American countries. However, Ngai has warned that it would be very costly to import crude oil for domestic refining, which would make the domestic products more expensive than imports. Ngai went on to say that Vietnam needs to have its own oil refineries to be self-sufficient in petroleum products. However, it needs to think carefully about the number of refineries it needs to have, or it would face the oversupply.